This will provide service during Finals Week and give us time to figure out how many people will still need the service over the summer semester. As a reminder, the DOT&PF highway project has closed pedestrian and bicycle access to the Anderson Building. Those wishing to get to the Anderson Building need to take the UAS Shuttle Bus. Bicyclists will need to lock their bikes on campus and take the Shuttle Bus. Thank You or your patience. Pedestrian route to the UAS Anderson building is changing starting Friday April 14, 2017. 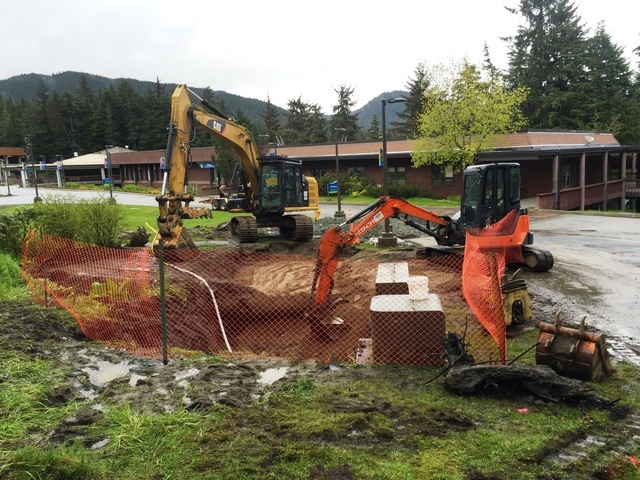 DOT&PF and their contractor SECON are starting construction of the Glacier Highway reconstruction project and need to close off the sidewalk that leads to the Anderson Building. This means there will be no walking access to the Anderson Building. You can still get to the Anderson building using the UAS shuttle service or by automobile. This change in pedestrian access is expected to last most of the summer. Please follow all construction signs and directions given by flaggers. Construction sites are dangerous places and we do not want any of our UAS community to get hurt. The Contractor has created a website page where they will post important updates about the project. http://fritztoseaview.com/ They also will pose updates to their Facebook page called SECON Glacier Hwy. Reconstruction- Fritz Cove Rd. to Seaview Ave. 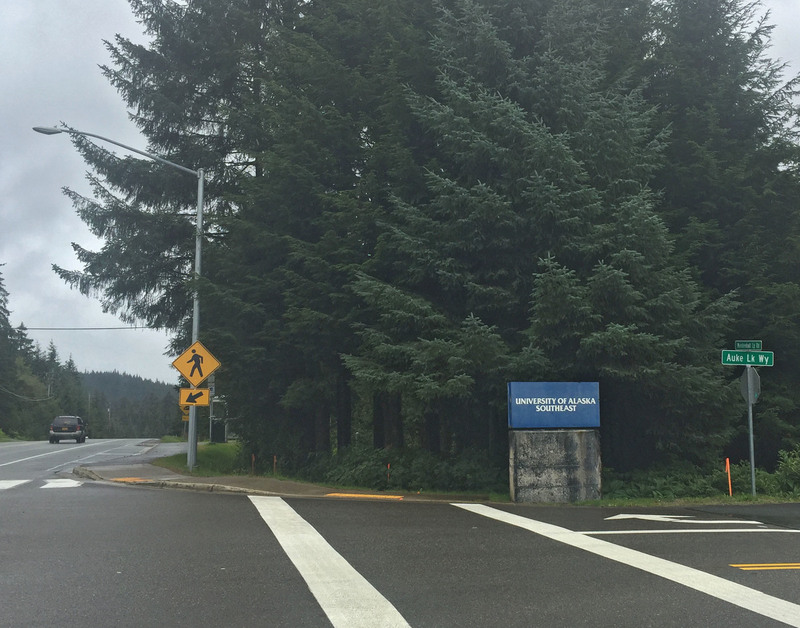 The Department of Transportation and Public Facilities posts construction notices on their Alaska Navigator web page http://www.alaskanavigator.org/ or by calling 511 automated phone service. All of these sites give you the option to subscribe to a feed that will notify you every time there is an update. 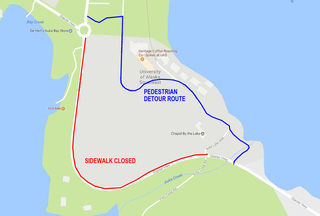 The Department of Transportation and Public Facilities will be rebuilding Glacier Highway from Fritz Cove Road to Seaview Ave. Their contractor SECON has already started preparatory work and in the coming weeks will have a full road crew working from 7am to 5pm, Monday through Saturday. The contractor will post weekly updates to their website www.fritztoseaview.com and Facebook page SECON Glacier Hwy Reconstruction Fritz Cove Rd to Seaview Ave.
After discovering the two letters that were damaged during shipping, we were looking at a 3-4 week delay to get the manufacturer to fabricate some new ones. We decided to take the letters to Glenn Ramsey our UAS Maintenance/Welding Adjunct Professor/Handy-man and all around good guy. Glenn performed his magic and had them back to us the next day. 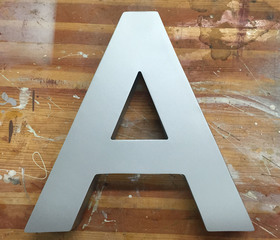 So you may ask, why are the fixed letters still sitting on my desk? Unfortunately the manufacturer did not ship all of the sign parts and we have had to wait for them to arrive. The Contractor thinks they will be ready to get back on this project early next week and be complete by the end of the week. 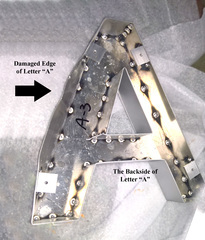 While unpacking the parts to our new UAS sign, we discovered that two of the letters were damaged during shipping. The whole story can be told by just looking at the shipping crate. It had been a long week at the grind stone and “Todd” was tired and wanted just to get the job done and go home. Todd’s boss had been riding him for days now to pick up the pace or there would be no Christmas bonus. The shipping crate was very long, over 10-feet and the forks on Todd’s fork lift were only 4-feet long. Stopping to change over to the 8 foot long forks would take another 10 minutes. That’s 10 minutes that Todd couldn’t bear to take with so many other crates waiting to get loaded, the sound of Todd’s boss shouting in the background and the longing call of his reclining chair at home. Todd read the freight sticker and saw that the crate was very light and the crate was built out of OSB (Oriented Strand Board) which is tuff stuff. Have you ever tried to hammer a nail through OSB? Todd figured he could gently lift the crate without switching to the longer forks. So Todd picked up the crate and all was going well until he heard a loud “POP”. Todd loaded the crate, finished his shift and went home without telling anyone. The POP that Todd heard was the tips of the forks on the fork lift punching through the OSB and damaging some letters of our UAS Sign. OSB is made by gluing small shavings of wood together and it is very tough. However, when it does break, it does so without warning like a piece of chalk snapping. So there would be no warning sounds coming from the crate before it was too late. 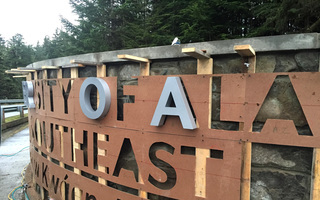 Todd may have save himself 10 minutes, but it will now cost the Manufacturer, Freight Company, Insurance Company and UAS much more time and money to fix the couple of damaged letters. The moral of the story: Do it right the first time. The Contractor is now installing the remaining sign letters next week the electrician will wire it all up. Please be patient if our sign is missing a couple of letters until we can get them repaired or replaced. Our Contractor will be starting to work on a new UAS sign at our entrance off Back Loop Road. 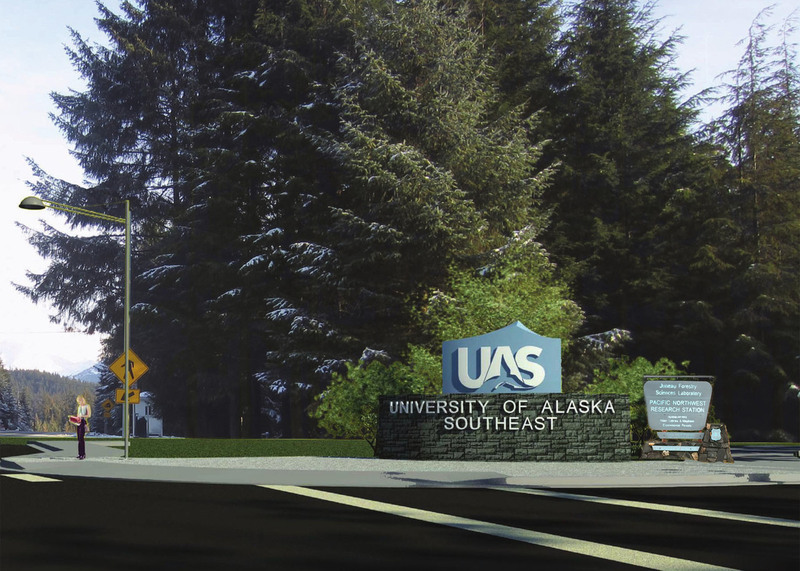 The existing UAS sign has been there for more years than most of us can remember. It has served UAS well and now deserves an opportunity to be recycled into something new. UAS committed to building a new sign more than 5 years ago and it has taken this long to obtain the necessary permits and approvals. We are excited that this project is becoming a reality and know that it will strengthen UAS’ presence in our community. 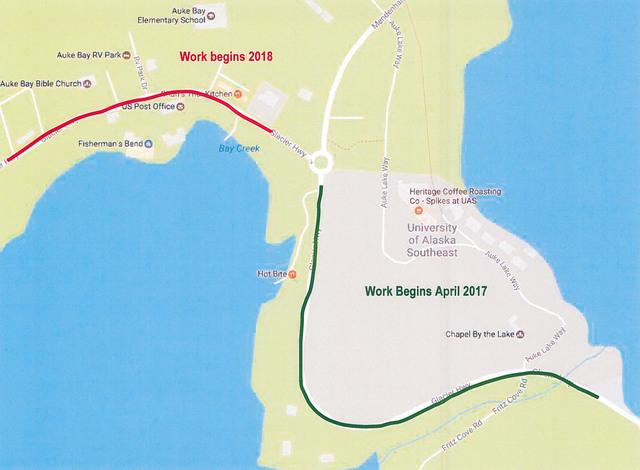 Please keep a watch for construction near the Back Loop Road and Auke Lake Way intersection until mid-October when the project is scheduled to be complete. 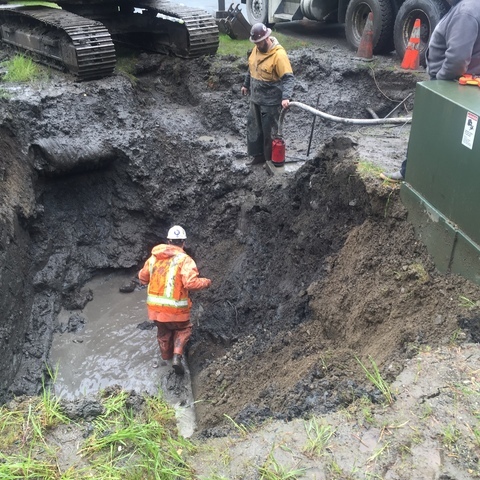 What started out as one day’s work has turned into more....... Construction on the UAS waterline repair started early Thursday morning with high hopes of making the repair by the end of the day. 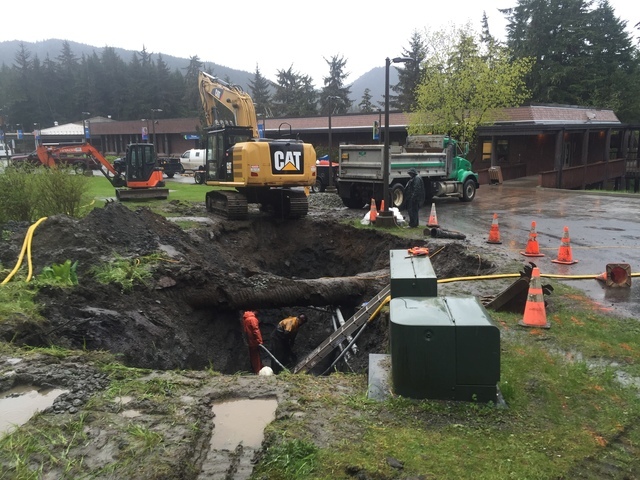 However, wet weather, a maze of other underground utilities and a bunch of concrete that had to be hand chiseled away from a pipe connection stretched the project out until 6:00 PM Friday before we could get the water turned back on to Hendrickson Building, Soboleff Building, Hendrickson Annex, and Soboleff Annex. 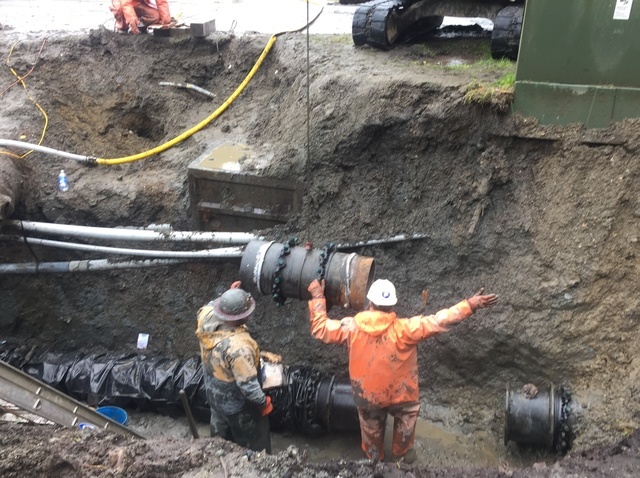 Just when the work crew was ready to head home for a hot meal and warm shower, UAS experienced another waterline break that shut down the water to the John R. Pugh residence hall. What a disappointment…. Sort of like making the winning goal, only to have it recalled due to a penalty. Or like hiking the Chilkoot and getting to Bennett Lake Lodge just to find out they ran out of stew and sourdough rolls. It was a long day. Good news is that the John R. Pugh Residence Hall is the only building affected and we have 7 days before the summer guests start showing up. This is plenty of time to make another repair to the waterline. A big Thank You goes out to the Admiralty Construction Crew for working long hard hours to get our Campus back on line. Below are some photos of their work. Pump in the bottom of the trench keeps water out of the trench. The Contractor also had two additional pumps just uphill pumping water around the trench. 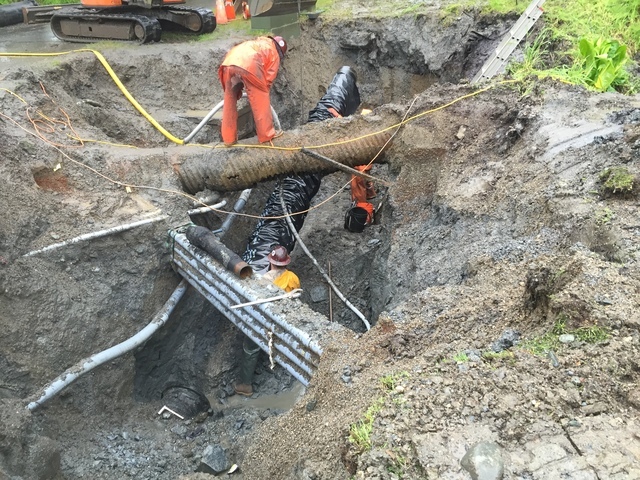 Two new pieces of pipe were installed, One 20-foot section and a 4-foot section. This required 5 connections with 14 tension bolts and 14 compression bolts each for a total of 140 bolts that needed to be installed. Tightening the bottom bolts are always difficult. 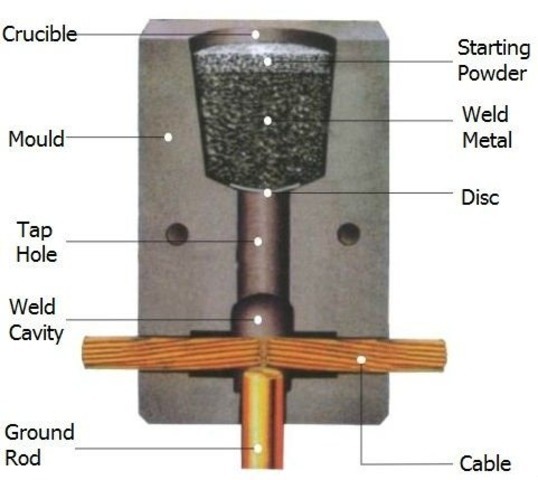 Exothermic Welding of Wire from Cathodic Protection to Waterline. Exothermic welding is a welding technique that uses an exothermic reaction of a thermite composition to heat a base metal to a molten mass that permanently bonds the wire to the pipe. This process requires no external source of heat or electricity. On the morning of August 25 2015 UAS experienced an a waterline break, shutting down water to campus just a couple days before freshmen were to enter the John R. Pugh Residence Hall. Fortunately, Admiralty Construction was able to pull their crew off another project and make an emergency repair. We were also fortunate that CBJ had a piece of 16-inch pipe we could use for the repair. 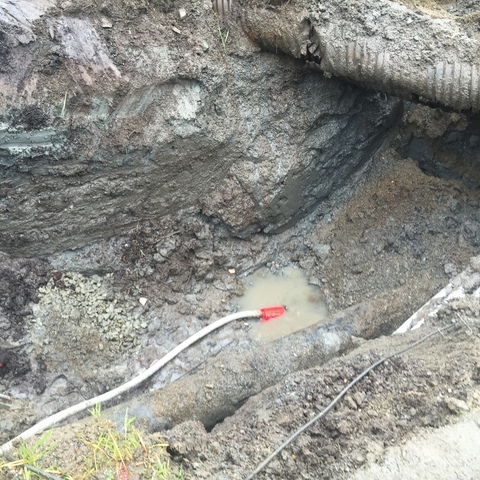 Corrosion (rust) was the cause of the August 2015 waterline break. The following photos shows just how much the pipe had corroded before it finally broke. 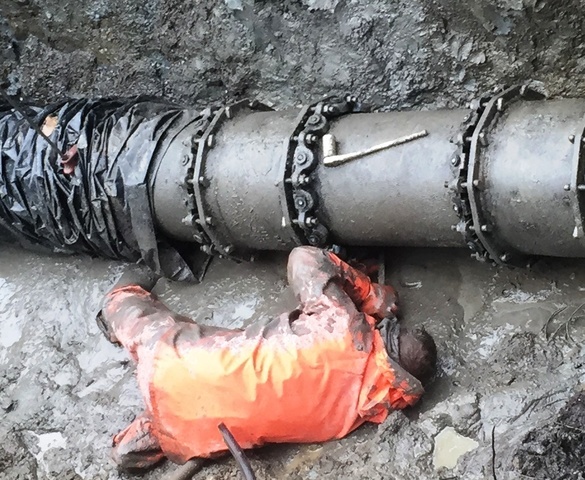 This pipe is 16-inches in diameter and once had a wall thickness of 0.40-inches. Notice how the pipe joint bolts have corroded so much the heads of the bolts are almost gone. Corroded Pipe from UAS August 2015 Repair. Ductile iron pipes are protected from corrosion by a cement lining on the inside and a protective coating on the outside. This protection system typically lasts for 50+ years. Our UAS pipe is 30 years old. 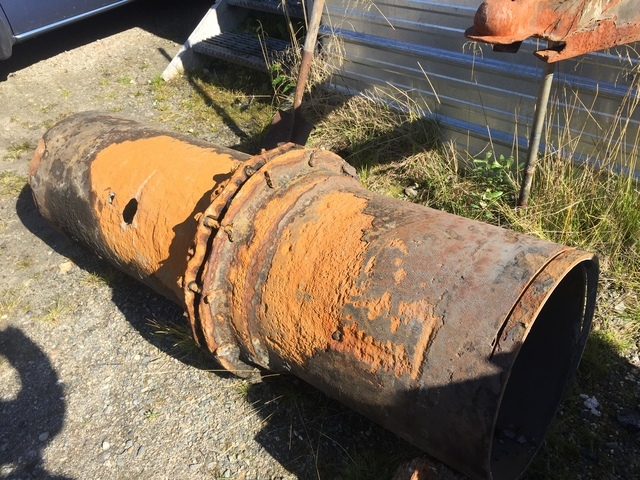 Early corrosion of a pipe can be caused by many things, with corrosive soils and electrolysis being the usual culprits. We do not know for sure what caused the corrosion in UAS’s water line and running tests to find out, cost much more than repairing the pipe. However, electrolysis is my best guess based on the number of electrical conduits seen in the below photo. Also, records show that an electrical transformer sat on this site for many years. We are taking additional precautions against corrosion for this waterline repair. 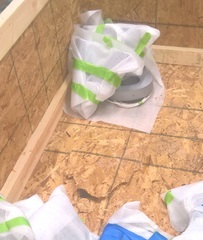 First is a high density polyethylene covering around the pipe. 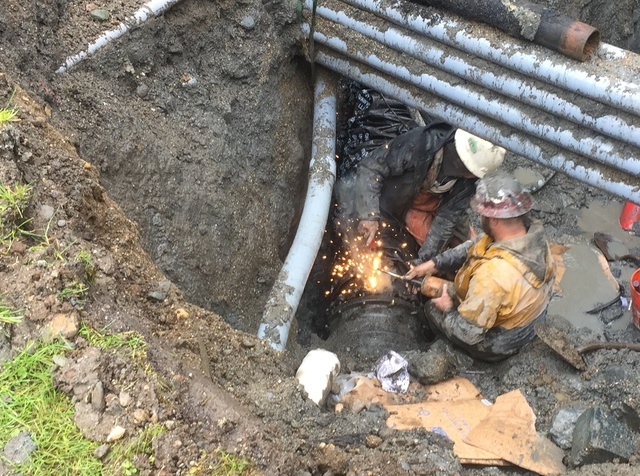 This breaks any stray electrical connection between the pipe and the surrounding soil. Second, we are adding some sacrificial zinc anodes attached to the pipe. Zinc is an more excitable element than steel, so the zinc will corrode first, thus protecting the steel pipeline. These function the same way as zincs do on your boat. The Contractor has been working with Water coming up from the ground, Water falling from the sky and Water leaking out of the pipe. UAS Staff in the Hendrickson Building, Hendrickson Annex, Soboleff Building and Soboleff Annex have been working without any Water. Today makes us appreciate Engineers and Contractors who deliver water where we want it and keeps it from places we don’t. UAS Campus has several wonderful places to have a picnic, sip morning hot chocolate or just take a short break. The Anderson Building parking expansion project has just added one more that I feel is the Picnic Paradise. 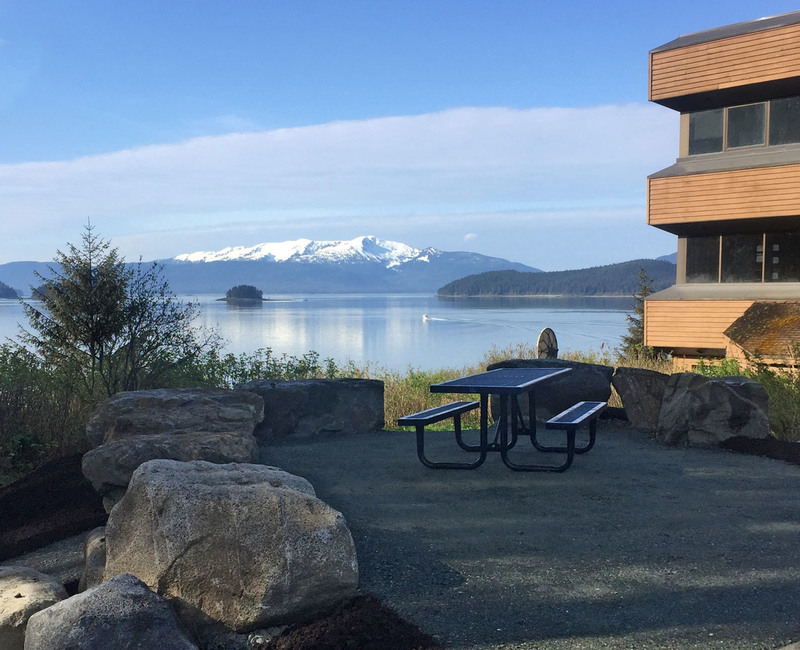 The view from Picnic Paradise this morning included bright blue skies, snow caped Admiralty Island, flat calm Auke Bay and some guy in his boat who did not have to go to work today. Later this spring the view will include a blooming lilac bush that the Bedford family planted in their back yard more than 20 years ago. During a mid-day break or during lunch, this will be a great place to take in your vitamin D on sunny days. 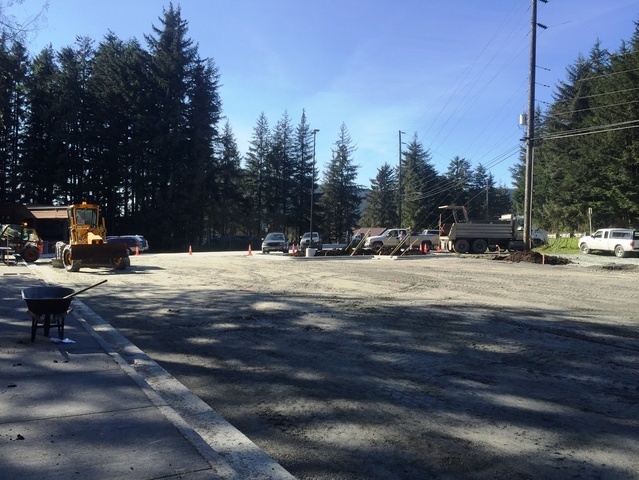 The Contractor started this project last fall and was not able to get it completed before the asphalt pavement plant shut down for the winter. This spring the Contractor installed the sidewalks, parking lot lights and has prepared the grade for asphalt pavement. Provide that we do not get heavy rain on Saturday they will pave the parking lot and complete this project. However, the construction by the Anderson Building will just be starting. For the next two summers, the Department of Transportation will be rebuilding Glacier Highway from Fritz Cove to Seaview. Their project will add sidewalks to both sides of the road, streetlights, and wider shoulders for bicyclists. It will also relocate our driveway entrance to the Anderson building and eliminate about half of the parking in the existing lot. This is the reason the Anderson parking lot had to be expanded. Valentine’s Day is a good reminder that relationships need to be continuously nourished and reinforced to keep them strong and healthy. Neglecting or taking for granted is a sure way to weaken or completely lose a relationship. In Alaska there is a beautiful view around every corner. So it is easy to forget our relationship with Auke Lake, a wonderful gem right in our back yard. UAS selected several staff and faculty over this past summer to work with a professional land planner to develop a UAS Shoreline Master Plan. We worked on the Plan for the past 7 months, developing a purpose and need statement and then exploring many different elements that UAS could implement to strengthen our connection with Auke Lake. The Plan went through several revisions, with many elements being added and removed in effort to come up with a plan that meets the needs of the UAS community without defeating the purpose of strong relationship with Auke Lake. The Master Plan has now progressed enough for posting on the UAS website under Facilities Services. 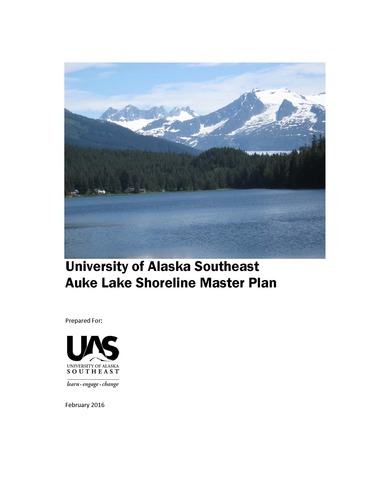 This Valentine’s Day as you read the UAS Auke Lake Shoreline Master Plan, you will see how we identified several ways to strengthen UAS’s connection to Auke Lake. If you have other relationships that need strengthening, I recommend developing your own Master Plan. January - The Perfect Time For….